When avocados are in season, South Africans buy them by the box and use them in wraps, on pizzas, in dips, and seared on the braai as well as in salads. Use cooked prawns if you prefer, folding them into the sauce and reheating quickly before serving. Mix the chilli sauce, lime juice and orange juice in a bowl. Peel the orange and cut it into segments. Slice the avocados lengthways and arrange the slices with the orange on serving plates. Heat a wok and drizzle in the oil. Add the ginger, chilli and red pepper and stir-fry for 1 minute. Add the garlic and prawns to the wok and stir-fry for 2–3 minutes until they turn pink. Add the chilli sauce mixture and warm through. 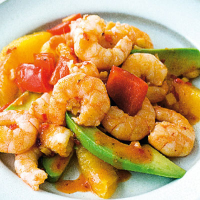 Pile the prawns on top of the avocado and orange slices and serve.